Russian manned spacecraft. Cancelled 1989.' Super Soyuz' replacement for Soyuz and Progress. AKA: 14F70. Status: Cancelled 1989. Payload: 3,000 kg (6,600 lb). Gross mass: 15,000 kg (33,000 lb). Height: 5.00 m (16.40 ft). Concept was reusable spacecraft, launched by Zenit launch vehicle, with all possible systems recovered in landing module, together with significant payload delivered to and returned from orbit. Carriage in payload bay of Buran shuttle was also a requirement. Preliminary design work began on 27 January 1985. The design was briefed to the Military-Industrial Commission on 22 December 1986. However the project was cancelled in January 1989 on financial grounds. Launched into a 190 km, 51.6 degree orbit for docking with Mir-type space stations. In this role it would have carried two to four crew plus around two metric tons of payload up to 300-550 km orbits and back to earth. 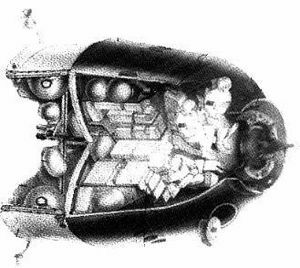 Rescue or lifeboat configuration, with 1,2, or no crew, returning up to 12 cosmonauts to earth (4 on first floor and 8 on second floor of capsule). In unpiloted form, as a spacecraft for resupply or refueling of spacecraft in high orbits up to 36,000 km (geosynchronous) altitude. The capsule was 3.7 m in diameter, and had a total mass of 13 metric tons. When flown manned, 5-6 crew and 1,500 kg of cargo could be carried. If unmanned, a maximum cargo of 3,750 kg could be carried. An androgynous docking system was mounted at the front of the spacecraft, as were the antennae of the radio systems. A small engine module was mounted at the rear for orbital maneuver and retrofire. It was jettisoned before re-entry and was the only expendable part of the spacecraft. After re-entry, a stabilization parachute was ejected. This was equipped with a radio altimeter in the parachute lines. Just before impact with the ground the altimeter triggered a large array of rocket engines arranged in a circle around the body of the re-entry vehicle. These braked the capsule to a soft landing. 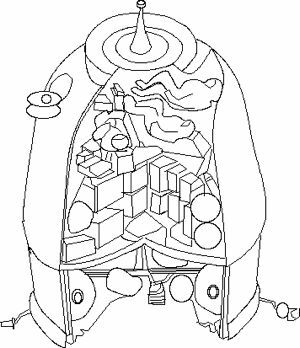 The braking and orientation engines were liquid propellant but used non-toxic propellants since they were housed within the capsule. The design had several defects, chiefly the severe acoustic environment inflicted on the crew in the braking maneuver and the lack of any back-up landing system in the event of failure of the braking rockets to ignite. Crew Size: 8. Orbital Storage: 270 days. Family: Manned spacecraft, Space station orbit. Country: Russia. Spacecraft: Zarya VA, Zarya NO. Agency: Korolev bureau. Bibliography: 191, 89. 1985 January 27 - . 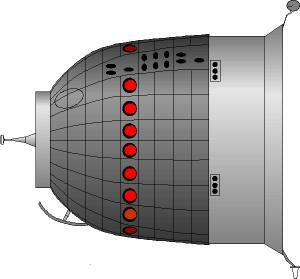 Preliminary design work began on Zarya 'Super Soyuz'. - . Nation: Russia. Spacecraft: Zarya. Concept was reusable spacecraft, launched by Zenit launch vehicle, with all possible systems recovered in landing module, together with significant payload delivered to and returned from orbit. Carriage in payload bay of Buran shuttle was also a requirement. 1986 December 22 - . Zarya 'Super Soyuz' briefed to the Military-Industrial Commission. - . Nation: Russia. Spacecraft: Zarya. 1989 During the Year - . Zarya 'Super Soyuz' cancelled on financial grounds. - . Nation: Russia. Spacecraft: Zarya.